For whatever reason, when I hear that phrase “pushing your boundaries” I get the image of being under massive amounts of blankets and comforters. It is warm and cozy inside… a veritable cocoon of peace and serenity. It takes great effort, especially on cold and rainy days like today to push those suckers off and step “outside.” We muster our physical and mental strength and kick and push them aside. Finally, when we are upright, feet on the ground, we are ready and find our selves at a new sense of beginning. This is where I find myself today. I enjoyed some lovely relaxing “recharge” time this weekend with my family. I watched my determined children swim in seriously cold water because the temperature alone was not going to squelch their desire. We enjoyed time and moments together and then WHAM! Yesterday held sadness and unrest. It raised unforeseen walls and barriers to navigate on my family’s path. It literally sucked the wind out of my sails. So today, it would be easy, really easy, to climb back under my covers on this cold and rainy day. It would be easy, so easy, to slink back to what I know and hope that all would turn out fine. It would be easy, super easy, to let someone else derail my dreams for myself and my family. But today, like every day, I have a choice. I can push my own boundaries or let someone else define them. I can step outside my comfort zone and find new strength or I can let someone else push me back in. 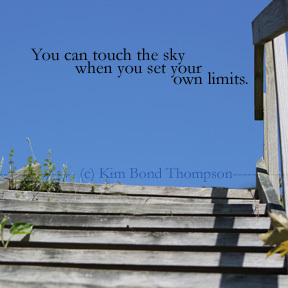 Who is setting your boundaries today? I think we endure these times in order to find out who we really are and how strong we can be ….. it’s hard, but it passes. Great writing Kim, thanks for sharing!